Follow this procedure to complete licensing using the Genero Report Engine for Java Licenser GUI application. During installation the license is registered with Four Js via the internet and the installation and maintenance keys are installed. Before you begin: You must have internet access from the machine you are licensing the product to validate the license. Launch the Genero Licenser application. 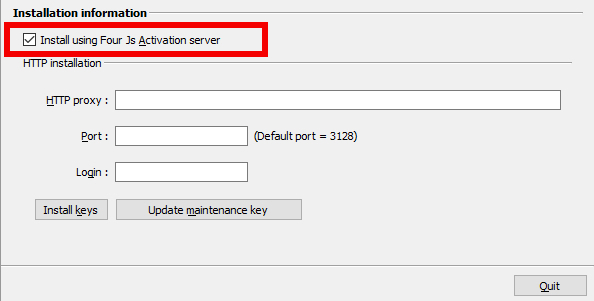 Select the Install using Four Js Activation server option. If access to the internet is through a proxy, provide the required information for HTTP proxy and Port options. In the Login field, enter your customer code. Your product is now fully licensed. The License status is updated. In the field under Licensing status you see your maintenance key is valid until the date displayed after End of maintenance date. When finished, select Quit to exit the application.